We’re honored that the article featured our research and the innovative flexible work culture initiatives of two of our clients, BDO USA and CECP. 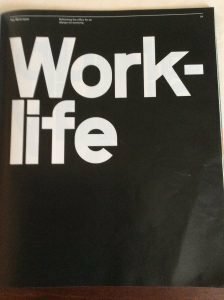 But, what really matters is that The New York Times got it right: “Work-Life” is a top business trend. 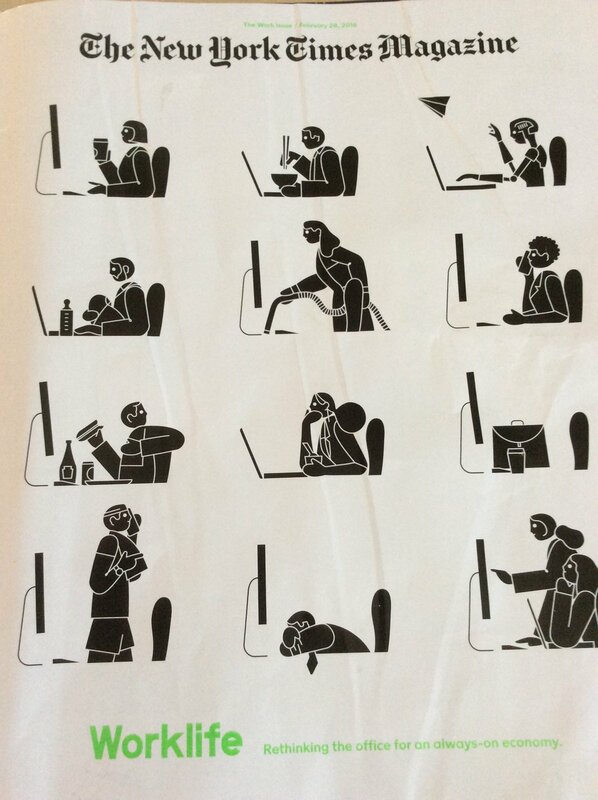 In fact, “WorkLife–Rethinking the office for an always-on economy” headlined the front page of the print version of the magazine (please note all of the fantastic images shared below were created by James Graham for The New York Times). This alone is huge. 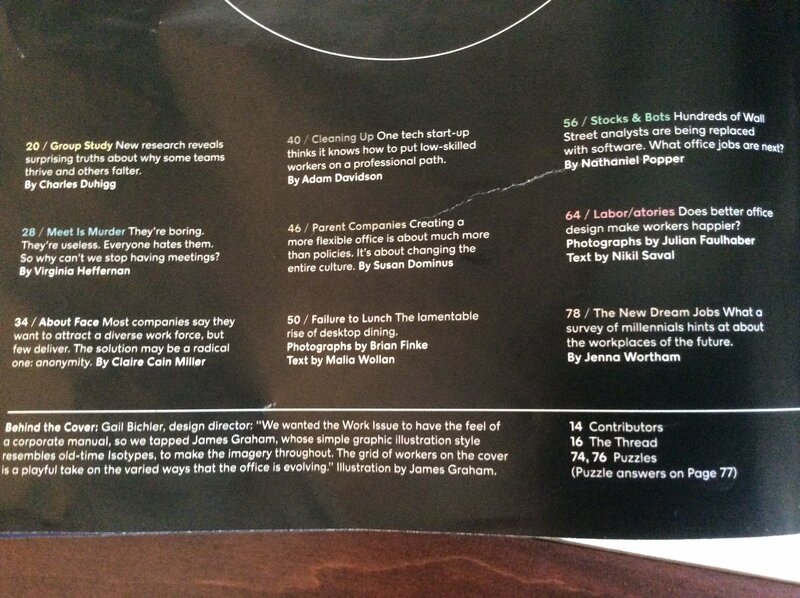 But then, in the table of contents, the article in which our work is mentioned–“Rethinking the Work-Life Equation (online title) or “Parent Companies” (in print title)–sits smack dab in the middle of the other key trends covered in the issue. 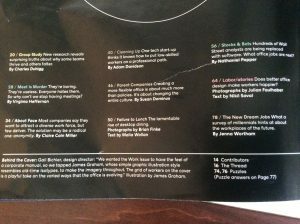 This placement at the center of “what Google learned about teams,” “the post-cubicle office,” “diversity in the workplace” and “failure to eat lunch” is symbolically appropriate. 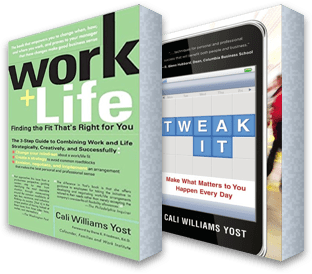 All of these trends inter-relate and influence how we flexibly fit work and life together to be our best, on and off the job. Next, there are the two pages that kick off the issue. 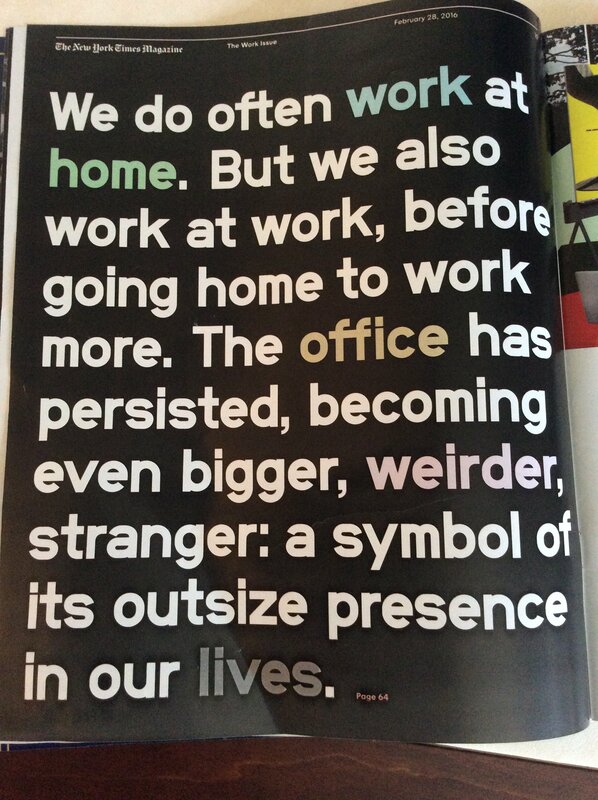 The first page is a perfect description of today’s complex, flexible work+life fit reality we now need to manage. 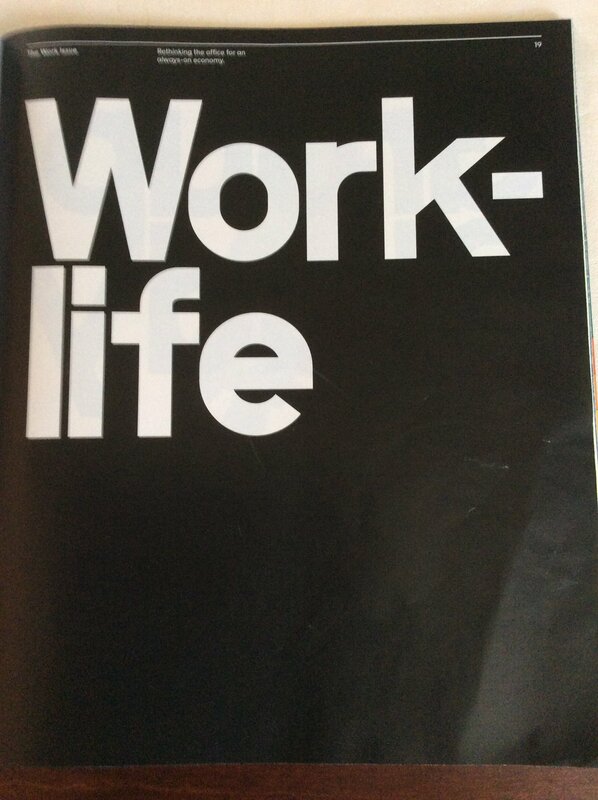 And the second page simply says it all, clearly and concisely…Work-Life. 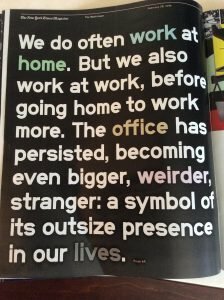 Finally, the graphic that accompanies the “Rethinking the Work-Life Equation” article is one of the best visual depictions of the uniqueness and fluidity of each person’s work+life fit I’ve seen. Hopefully, the message and symbolic position throughout the entire issue will FINALLY shift flexibility and work+life fit from the category of, “perk, benefit, policy,” where it doesn’t belong, to “strategic business imperative,” where it should be. I also hope that organizations will be inspired to devote attention and resources required to develop a work culture that is both high performing and flexible. That’s the cultural combination that will attract and retain top talent, increase productivity and improve employee work+life fit. Many thanks to The New York Times Magazine. 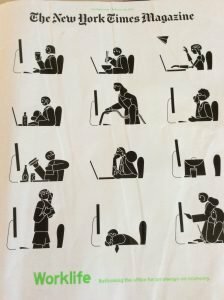 Work, life and flexibility are indeed the future of work. Let’s stay connected! I invite you to sign up to receive our monthly newsletter and connect with me on Twitter @caliyost and Facebook. The terms High Performance Flexible Work Culture and Work+Life Fit are registered trademarks of Flex Strategy Group.